Words of Radiance is book two in Brandon Sanderson’s huge STORMLIGHT ARCHIVE series, projected to be ten books. In fact, at 1100 pages, Words of Radiance is almost large enough to be its own series (at least once upon a time — I’m thinking say of Zelazny’s AMBER series, or Donaldson’s original COVENANT trilogy). With another eight thousand pages to go, who knows whether the trip will be worth it, but at this point the car is humming along, the scenery is nice, and the kids are getting along in the back seat. Part of the reason the series is off to a smooth start is Sanderson’s consistent facility with regard to pace and plot. I have always found his books to regularly feel shorter than they actually are (one reason I was happy he was chosen to finish the WOT series), and that holds true with Words of Radiance, if not to quite the same extent. As mentioned, the novel comes in at 1100 (technically 1080) pages, but I happily finished it in two sittings and it felt more like 700 – 800 pages. That said, there were times where scenes felt like they went on a bit too long and overall, the book probably could have lost 100 – 150 pages with little detrimental effect. That’s a relatively small complaint though and for the most part the book zipped along and is well paced with a complex and mostly compelling plot. And it is a full plot. As before, we follow several major storylines. On the Shattered Plains, amid the warfare between the Alethi and Parshendi, Dalinar, the uncle to the Alethi King, continues his attempts to unify the Alethi and find peace with the Parshendi, even as he suffers more visions of a terrible storm to come and even as his adversaries become more violent in their opposition to both him and the king he threatens to overshadow. Kaladin begins to move up the status list as he becomes trusted more and more by Dalinar and eventually Dalinar’s sons, eventually becoming head of the king’s bodyguards, though he himself is unsure if this king is worth guarding. He also continues to hone his strange powers. Shallan and Jashnah meanwhile journey toward the Shattered Plains, trying to reunite Jashnah with her family, perhaps match Shallan with Dalinar’s son Adolin, and find a lost city that may hold the secrets of the Knights Radiant and the Voidbringers. And we also get a POV from the Parshendi side, as their war leader Eshonai is faced with a monumental that will affect her entire race, as well as the humans they war against. That would have been enough for most novels, but we also get background stories for several main characters, “interludes”, and subplots involving new settings and characters, side characters such as a White Assassin and a Black Constable, each of whom cuts a swathe of death and destruction through their chosen class of victims. In the first book, I thought that sometimes the major strands were unbalanced, but here Sanderson does an excellent job of juggling all these threads and scenes, transitioning smoothly amongst and between them, spending just the right amount of time with each before moving on and often doing so in a way that allows for greater suspense, or for a powerful moment to linger a little longer. Plotting has always been one of Sanderson’s strengths and it shows throughout Words of Radiance. The worldbuilding is clearly predicated upon the idea that this series is going to be massive, and so while we learn more about various aspects of the world, its people (particularly the Parshendi), the spren, and the magic systems, the information is parceled out relatively slowly and there are lots of mysteries left for further exploration. Some may find this a bit frustrating, or find the digressions (or at least apparent digressions) to other places/people indulgent, but I like how Sanderson is taking his time with all this. Characters also build slowly, if at times a bit predictably. Both Shallan and Kaladin come into their own, but not without some sense of loss and a questioning of methods, and their backstories, particularly Shallan’s do a nice job of fleshing out motivations and responses. “Villains” are given a chance to present their case, some more effectively than others, adding a nice layer of complexity over events. Some new side characters immediately charmed me, such as an older Alethi knight that Shallan aligns herself with a young sassy thief (is there any other kind?). Even those barely introduced offer up intriguing possibilities. And with so many characters, and so much time to spend in this world, Sanderson isn’t afraid to kill off a few, which ratchets up tension nicely, though I’ll point out there is a worrisome trend with regard to that (which is all I’ll say here so as to avoid major spoilers). The weaker parts of the novel, and “weaker” is relative here, are what one might expect having read Sanderson before. He has never been much of a “stylist,” and while I do not at all trivialize the ability to write fluid prose that mostly effortlessly carries the reader along through a thousand-plus pages (believe me, having suffered through far shorter books by far worse authors), I do at times find myself wishing for at least some memorable turns of phrase, some moments where I respond just to the language itself. Beside that wish, I sometime was jarred out of the story by surprisingly modern language choices, such as characters going “wow!” It didn’t happen often, but more than once or twice. Beyond the stylistic element, sometimes I’d like to struggle a bit more, odd as that sounds. When I read Sanderson, even as I enjoy him as I almost always do, it all feels right there, everything is on the surface in plain sight, and sometimes I’d like a sense of swimming in deeper waters, especially over such a great length. Don’t get me wrong — there is work to do in keeping plot straight or putting together clues as to what happened when or who is who. This is an incredibly complex and rich world Sanderson is creating, not just in this series but throughout many of his works, which are all part of a larger vision. So he has that kind of difficulty going for him in spades. But I wanted that same kind of work beyond the “simple” plot narrative. I suspect I’m in the minority there, however, so it’s hard to fault him for it, just as it’s hard to fault him for “effortless” prose that doesn’t call attention to itself (note, I did say that the weaknesses were “relative”). Finally, while there is a good bit of welcome humor in Words of Radiance, there is also unfortunately a good deal of strained humor and several times, especially in Shallan’s case, attempted humor that goes on far too long. Lastly, it wouldn’t be complete to not mention the artwork that runs throughout, including many full-page panels. While I’m not sure thousand-page ten-book series are going to be a huge trend, I wouldn’t mind if Sanderson starts something with this and more publishers picked up the idea of working more art into their works. 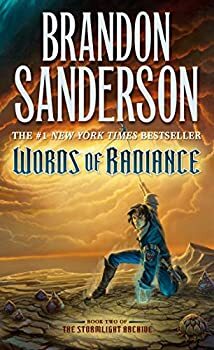 If Words of Radiance/THE STORMLIGHT ARCHIVE doesn’t quite reach my own personal top tier of fantasy fiction, it still has made for two thousand pages of smooth, nearly continuous enjoyment and as long as Sanderson is driving, I’m more than happy to go along for the rest of the ride (unless there are show tunes. I draw the line at show tunes). On an entirely different note, I can’t help but feel, after what was revealed in the flashbacks, that the strain in Shallan’s humor is at least partially intentional, or at least justified. Thanks for the link. I mostly agree with Sanderson’s goal and actually think he mostly succeeded. I felt it over-long in that scenes sometimes went on too long, rather than in the sense that entire segments, such as an interlude or two, should have been removed. More a matter of single scene pacing/length as opposed to whole book content/too many things included. I can what you mean re Shallan. But that’s a tough line to walk as an author and I’d say he wasn’t fully successful. But the point makes sense. Agree with your strengths and weaknesses. I remember in Book 1 that the characters kept telling us how witty Shallan is, but her wit as actually laid out on the page was painfully flat, a definite stylistic limitation on Sanderson’s part. And it is also true that his work goes down too easy; there is not much to point to in the way of depth or challenge to the reader. On the flip side, he is superb when it comes to plotting and pacing, and I certainly enjoy reading all of his work. I look forward to Book 2.